The Bulls Monday lost 107-98 to the Cleveland Cavaliers, their consensus rival for supremacy in the Eastern Conference. There wasn’t all that much to make of the result with LeBron James sitting out almost the last seven minutes, the Bulls’ Jimmy Butler out with a sprained thumb and James and Derrick Rose often playing at different times. But it was the most significant game for the Bulls in the 2014 preseason, arguably their biggest game in years. That’s because Rose with a brilliant 30 points that included four-of-five three-pointers with five rebounds, three assists and zero turnovers had his best game in two and a half years, his most productive and impressive since that fateful April 2012 day he tore his anterior cruciate ligament. And it was in the second of a back-to-back on the road and against the team many predict to contend for an NBA title. But in Rose’s dispassionate way of phrasing and explaining was a driving passion for the game the Bulls have rarely seen as Rose last season struggled to regain his form before going out again in late November with the meniscus tear. That basketball effervescence was bubbling over on the Ohio State campus. They came to see LeBron James. They had to go home talking about Derrick Rose. “He’s the fastest guy on the court, by far,” said Joakim Noah. It began with the Bulls’ first score as Rose blew by Kyrie Irving for a layup. And though Rose rarely discusses such things publicly, it was Rose backing up Irving for USA Basketball this summer when Irving was named tournament MVP for the gold medal winning USA team. Rose was more in recovery mode with USA Basketball, but he left Irving spinning like a top, bouncing like a yo-yo, often his personal toy as Rose went by, around and through Irving with seeming ease. And late in the third quarter, the usually taciturn Rose grew emotional after believing he stood his ground to draw a charge. Yes, against Irving. Rose leaped up and was restrained by Pau Gasol and Mike Dunleavy before Irving went to the free throw line. Though Irving finished with 28 points on 10-of-19 shooting with seven assists, he scored the majority of his points in a third quarter stretch into the fourth quarter with Rose off the floor. It maybe was a little personal for Rose against Irving, though Rose is more accomplished. But it was more so a quiet statement amidst the louder one for Rose as he banged in jump shots mostly set up off his dribble and accelerated through the Cavs defenses with regularity and often just with a burst in the half court. Noah said Rose’s speed is so spectacular and unusual even in the NBA that it’s an adjustment just for teammates to be in the right spots for the pick and roll, to get into the proper spacing because Rose goes so quickly you have to react differently than you would with anyone else. It was difficult to make that judgment Monday for several reasons. Obviously, it was a preseason game in which Rose played just 24 minutes and Butler remained out with a sprained thumb from Sunday’s win over Charlotte. Kirk Hinrich started for Butler, who will get an MRI Tuesday. Butler wore a splint on his left thumb. The Bulls, now 4-3, were once again outrebounded, which has happened with frequency in the preseason. The offense remained choppy, though coach Tom Thibodeau continues to mix and match lineups and rotations. Though the reserves outscored Cleveland’s 40-20, it’s an unsettled group with considerable play. It seems to be taking away from the potential effectiveness of rookie Doug McDermott, who thrives off team play but isn’t getting the ball much or looked to with that group. Dunleavy has gone back to starting after missing two games. He had eight points and made a pair of threes, though it was unfair to judge him trying to defend James. Overall, Dunleavy has played well. But his veteran expertise could be a nice balm for the offensive scars of the second unit while McDermott could prosper with excellent passing big men in Gasol and Noah. The first unit would seem to benefit as well as other than the scoring outbursts from Hinrich Sunday and then Rose Monday, the offense seemed often disjointed and ineffective. It would seem that Bulls starting group could use the spacing and shooting of someone like McDermott while the reserves when their shots aren’t going, particularly Taj Gibson with 12 points and Aaron Brooks with nine points, could use the savvy of someone like Dunleavy. Those issues will be debated and examined as the season progresses, but Monday was a clinic for the examination of the Rose expo. And the reviews were positive. It was Derrick and the Delightful and Encouraging Very Good Day. In addition to Rose’s shooting and flash point drives, what emerged was a better picture of that old cliché which no one ever is quite sure what it means of letting the game come to you. It was Rose not trying to go too fast like he often did in his comeback last year. He wasn’t blowing out of the backcourt other than on fast breaks. He was sizing up the defense, accepting a screen and making a move, pulling up when the defender dropped off, looking like the fastest from zero to sixty. Rose had just four points in the first quarter as the Bulls tried again to work to Gasol, who had 12 points and eight rebounds after a slow start, shooting five of 13 overall and one of six in the first quarter. Gasol had difficulty on defense with Anderson Varejao, who had 22 points, 16 in the first half. Noah in the Bulls’ two big men front line did a good job thwarting Kevin Love, who had nine points on two of 10 shooting and 13 rebounds. Love had little impact on the game. James had a quiet 18 points, seven rebounds and six assists as he looked to pass more, run the offense and play the lanes for steals. The Bulls didn’t do a very good job taking advantage of James’ cheating on defense as they seemed determined to get Gasol going inside early. And then Rose took over. Though James at the Cavs’ practice Monday morning said the Bulls were superior because of their experience, there seems little doubt of the Cavs’ talent level. The Cavs went to 5-1 and are averaging 107 points. The Cavs are going to be very good, but very different. The last time James was with them it was the Mike Brown’s snoozing walk it up defensive game. The Cavs under Blatt from the European leagues are pushing the ball more, though they are spotty defensively with Love and Irving. The Bulls shot 41.8 percent, but were missing open looks. James is trying to make up for the defensive deficiencies by getting in the lanes and coming from the weak side as he did to force an early turnover by surprising Gasol in the post and Dunleavy in the corner. 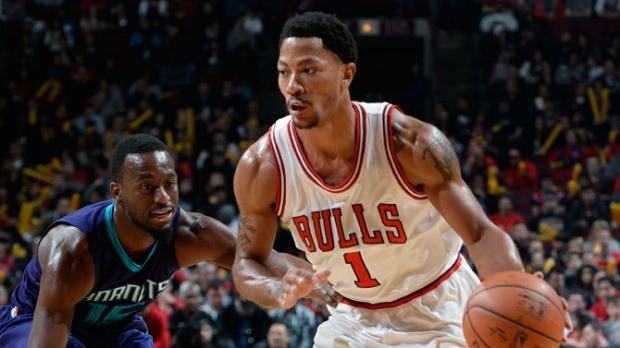 The Bulls didn’t react to that well early in falling behind 21-17 in the first quarter. Though once they started to move the ball, they got easier shots and baskets with James caught off his man. The Bulls were stalled into the second quarter, trailing the Cavs 34-25 when Rose, Noah and Gasol returned midway through the quarter. Rose then went to his offensive cellar for some vintage Rose’. There was a drive all the way, a three, a jumper, another drive, two more threes as the Cavs tried multiple defenders and on the last three Dion Waiters backed eight feet off Rose, fearing being driven past once again. Rose late in the quarter had a three-point play and the two three pointers in less than a minute to erase a seven point Cavs lead. Rose finished the quarter with 16 points on six of nine shooting, 20 points in the first half in just 13 minutes as the Cavs got a pair of late James free throws for a 51-49 halftime lead. Rose then came bolting out of the second half starting blocks, sprinting by Irving for the Bulls’ first seven points of the quarter—now 27 points in 15 minutes—to give the Bulls a lead. Gasol got going with a pair of nice inside moves as the Bulls led 63-62 when Rose departed with 7:32 left in the third quarter. Brooks and Tony Snell came in for Rose and Hinrich and Irving went off for 16 points. Rose returned with 6:29 left in the game and the Cavs leading 92-81. Thibodeau also got Noah back in to finish with Gasol to further test Noah’s stress level with his knee. Noah finished with six points, seven rebounds and five assists and playing with Gasol it seems likely Noah won’t score nearly as much as he did last season. But Noah said he felt better. Noah also had some fun with the crowd on the Ohio State campus as he was frequently booed given his history with Cleveland and Ohio of his playoff comments about the lack of Cleveland vacationers and his 2007 Florida team winning the NCAA title over Ohio State. “Good times,” said Noah, who generally travels with them. Gasol added another three pointer in his expanded shooting repertoire, McDermott got a jumper and Rose a long three with just over a minute left in the game. But even with James out, it was too much for the Bulls to overcome at the end. Especially with Rose playing as he did Monday. “He’s been up and down,” Thibodeau said of Rose. “Had some really good ones and had some not as good as you’d like. The last week or so his practices were a lot better. It’s reflected in the way he’s playing. He’s gaining more confidence. As I said, I thought that experience with USA Basketball, fives games in six days showed him he could handle (back to back). That helped him here. You are talking about an MVP caliber player. He makes the game easier for everybody. He’s getting baskets in transition, attacking in the pick and roll, in the paint making plays, great energy tonight. Though there’s not much better to be seen from Rose. Which is very good for October. The Bulls close the preseason against Minnesota Friday in St. Louis. They open the regular season in New York Oct. 29 with the home opener Oct. 31 against the Cavs.